Texas Governor Lays Out School Safety Plan In Wake Of Santa Fe Shooting : The Two-Way Arming more teachers, creating new alarm systems and changing mental health rules are part of a wide-ranging list presented by Gov. Greg Abbott, nearly two weeks after 10 people died in the attack. Citing a need to make "our schools and our state a safer place," Texas Gov. Greg Abbott unveiled a slate of policy and legislative changes on Wednesday that range from boosting security at schools to doing more to keep guns out of the hands of people who shouldn't have them. The proposals are part of the Governor's School and Firearm Safety Plan — a list of 40 recommendations for making communities safer. He detailed his new school-safety plan at the Dallas Independent School District's administration building. "We want action to prevent another shooting" like Santa Fe, Abbott said. Abbott spoke about "school-hardening strategies," such as reducing the number of entries and exits at schools and having "active shooter alarm systems" that can be easily distinguished from a fire alarm. That approach, he said, would help students and staff respond appropriately — and avoid sending students into hallways where they might be targeted by an active shooter. The governor also said state law should be changed to force courts to report a mental health adjudication that someone is "mentally unfit to have a gun" more quickly. The law should tighten that deadline to 48 hours from the current 30 days, Abbott said. Abbott's plan calls for adding school marshals — teachers who are licensed to carry firearms and go through training — as well as increasing the number of marshals per campus. Texas Gov. 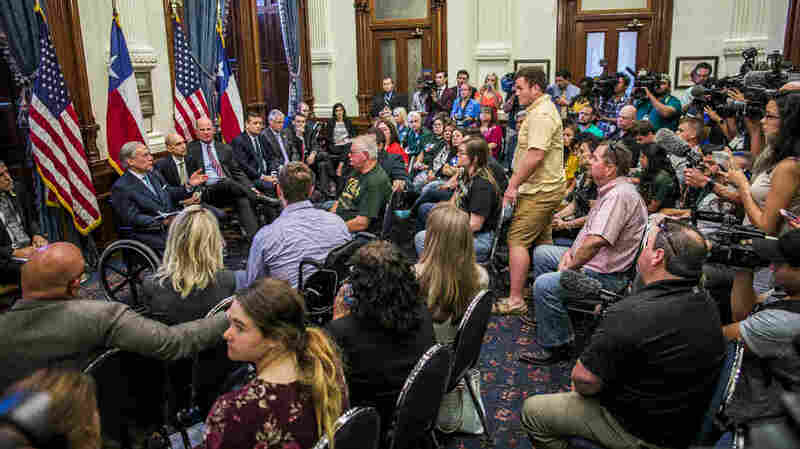 Greg Abbot hosts a recent roundtable discussion with victims, families and friends affected by the Santa Fe, Texas, school shooting that killed 10 people earlier this month. People with ties to other recent mass shootings were also invited. Noting that social media often contains clues about shooters' intentions before they act, Abbott said he wants to expand a program that has been tested in West Texas, which "uses mental health screenings to identify students at risk of committing violence," Abbott said. Called the Telemedicine Wellness, Intervention, Triage and Referral Project, the approach has been led by the Texas Tech University Health Sciences Center. Another initiative increases the presence of local police on campus, something Abbott said could be accomplished by adding schools to regular police patrols, and "allowing officers to use campus facilities for routine breaks, or for them to have a room located at that school, where they can fill out their reports." Abbott said he also wants to change Texas law to promote responsible gun ownership and give officials more authority to seize guns. The governor said he will ask the state legislature to consider a law "that would allow law enforcement, a family member, a school employee or a district attorney to file a petition in court seeking the removal of firearms from a person proven to be dangerous to himself or to others." When asked whether any elements of his proposal would be mandatory, Abbott said, "A lot of these are things the state will be doing," citing work on social media assessment programs. He added that "there is no resistance" from schools over adding safety measures. As for paying for the changes, he said his plan includes more than $100 million in grants, matching funds and other money. Leading up to the announcement, Abbott hosted three days of roundtable talks in Austin, meeting with survivors, friends and loved ones from recent shootings. He said that he had met with more than 100 victims and their relatives and that he had been "proud and inspired" by the students at Santa Fe. A key demand he heard at the meetings, Abbott said, was "for greater law enforcement presence at schools." Since Abbott was sworn in as governor in 2015, Texas has seen several mass shootings — this month at Santa Fe High and last November at the Sutherland Springs Baptist Church, where 26 people were killed in the small town east of San Antonio. And in 2016, a gunman killed five police officers during a protest against police shootings of black men. When Abbott visited Santa Fe High after the shooting, he said, "It's impossible to describe the magnitude of the evil of someone who would attack innocent children in a school, a place of learning where parents should be able to send their children without fear for their child's safety." As leaders often do after such an event, the governor asked for "prayers and support" for loved ones affected by the shooting. He also said, "We need to do more than just pray for the victims and their families. It's in Texas that we take action, to step up and make sure this tragedy is never repeated."